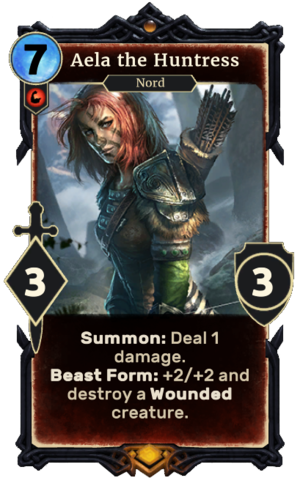 Aela the Huntress is a unique legendary Strength creature card. It is part of the Heroes of Skyrim expansion. If an enemy rune is destroyed while she's in play, she will change into her Werewolf version. In addition to the card's availability in the Heroes of Skyrim expansion, one copy is included in the Aela's Companions theme deck. "I'm ready for the hunt!" "The moons call to me!" This card's werewolf transformation applies the Blood Running Hot card effect. Concept art for this card was shown in displays at PAX East 2016. Aela first appeared in Skyrim. This page was last modified on 10 March 2019, at 10:47.